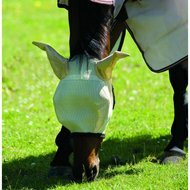 Fly mask with ears and eye freedom. Equipped with a fur band around the edge of the mask and a Velcro closure. Very nice quality mask. I'm just the little one for my pony. He always has bangs with everything. Only with this mask not. The Velcro should have been just a little longer. Unfortunately I could not find this in the description. 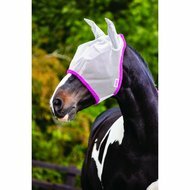 Very nice fly mask. In the summer always fly a lot through this mask which closes well and UV resistant is good to wear on hot summer days. No more dirty eyelids by the bliegen. Mask is well accepted by the horse. no chafe marks even in continuous operation. I find it difficult to give an opinion about this, this is also a product that everyone has a different opinion about, I would say try it out. 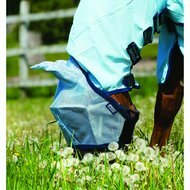 Fine fly mask, good fit and easy to use.